If you travel to, work in, or live in an area infested with Phytophthora ramorum, there is a chance that you could unwittingly spread the pathogen to other areas. What can be done to prevent spread? Below are some helpful details and links on sanitation measures to reduce the risk of spreading the pathogen. 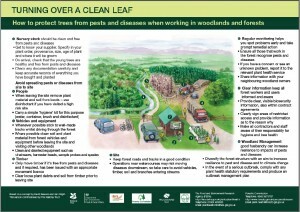 Turning Over a Clean Leaf – How to protect trees from pests and diseases when working in woodlands and forests. 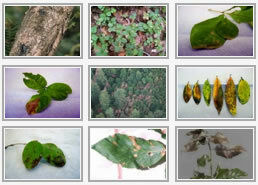 Movement of infected plants or plant parts. If infected plants are transported to a suitable environment with suitable hosts, chances are very high that the pathogen will become established. The rainy season is the time when the pathogen is actively producing spores and spreading naturally. It is also the time when you are most likely to become contaminated with the pathogen. Detached plant leaves and organic material and soil, which may harbor spores of the pathogen, are more likely to stick to you, your pet, your vehicle and equipment when they are wet. Contamination is more likely in settings where native hosts of Phytophthora ramorum are common, such as wildlands and developed areas that are within or adjacent to areas of native vegetation. The pathogen does not readily produce spores or spread naturally under dry conditions. Dry soil and organic material will not readily stick to you, your pet, or your equipment. Sudden Oak Death is not common in urban settings or suburban areas where native vegetation has largely been removed. Stay out of infested wildlands during high risk times altogether. Don’t collect or transport host plant material from an infested or quarantined area. Avoid entering infested areas during wet conditions. Keep vehicles on paved and graveled surfaces when conditions are wet. Stay out of areas of wet soil and mud. If you do enter an infested area during wet conditions, check yourself, your pet(s), vehicle and equipment for accumulations of mud, soil, organic material, and detached plant leaves. Remove these accumulations before traveling to an area that is not infested. If you live in an area infested with Phytophthora ramorum, chances are some of your belongings may be contaminated by the pathogen. If you travel to an area that does not have the disease, be sure that the belongings that you take with you are clean – shoes, bicycles, pets, vehicle, etc. Sanitation guidelines for professional crews: These guidelines describe the precautions that should be used to prevent pathogen spread when working in an infested area. Specific best management practices are identified for before, during, and after a job. “Compilation of Information on Spread of Phytophthora ramorum in Soil and Water” by Chris Lee, CAL FIRE provides capsule summaries of 14 papers to apply to management decision-making regarding the risk of P. ramorum spread. Should a diseased oak tree be removed? A tree with P. ramorum needs to be viewed and treated differently than a tree without the disease, but the disease alone is not justification for removing a tree. An important consideration with respect to any tree is whether or not it presents a hazard to life or property. All trees present some hazard, depending on the tree’s structural integrity and its potential to do harm should it fail and break off or fall down. Preliminary observations suggest that P. ramorum increases the risk of tree failure by providing an opportunity for sapwood decay fungi to enter the tree. Since heartwood decay is common in many older trees, sound sapwood is essential to the tree’s structural integrity. If both the sapwood and heartwood are decayed, tree failure may be imminent. The decision to remove a hazardous tree ultimately lies with the property owner. In order to get an assessment of hazard, contact a certified arborist or other qualified professional. Any dead tree has an increased risk of failure, but even dead trees have value, and if there is not a risk to life or property, consider leaving it standing. Standing dead trees provide important wildlife habitat and after they fall and decay, are a source of nutrients to be recycled in to the soil. Consult local ordinances governing the removal of trees. Experienced tree service technicians should conduct tree felling, as infected trees may have an abundance of structural wood decay. If there is an acute emergency, contact your city arborist, local fire, or police department. Will removing a diseased oak tree prevent the disease from spreading to nearby healthy trees? The threat of spread is generally not a valid reason for removing an oak tree with P. ramorum. Current information indicates that non-oak shrubs and trees contribute the most to disease spread. If an oak tree is infected, it will likely be surrounded by many other trees and plants that also harbor the pathogen. Hence, removing one or even a handful of infected trees will probably have little or no impact on local disease levels and spread. The only exception would be if local regulatory officials (County Agricultural Commissioner or Department of Forestry and Fire Protection) determined that an eradication effort was warranted. Eradication or suppression efforts would only be considered under very limited conditions — if the pathogen were newly established in an area, the infestation was small, and the area was well removed from any other infestations. If I have my infected oak tree cut down, what should be done with the wood? If possible, leave the material on site. For more information see the Homeowners Guide.